Well, we are still in the depths of winter in January, so all the winter constellations are still very well-placed for imaging. With so much going on in this 2 degree by 1 degree region of space – no wonder this is probably the most highly photographed area of the night sky. The whole region is rich in H-alpha emissions, so, if you can, you must include some H-alpha data with the RGB. I use my usual 20-minute sub-exposures for the H-alpha. Once again, you need to get as much of this data as you can reasonably acquire, and I would recommend in excess of 4 hours if you can manage it. 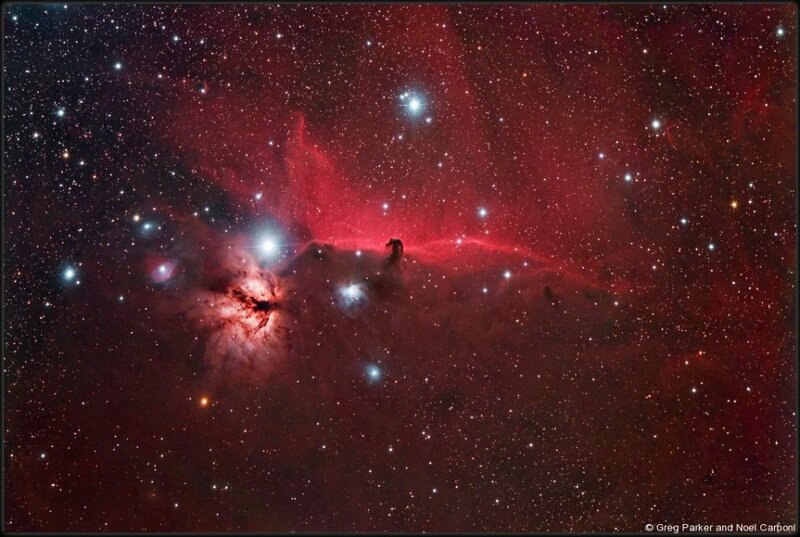 I have only recently acquired an SII and an OIII filter, so this accompanying wide field image of the Horsehead Nebula doesn’t have any OIII or SII data incorporated. Getting this additional narrowband data is one of my priority jobs for January 2008.